← Transmission of rare variants in parent-offspring trios – power or no power? Genetic imaging in Dravet Syndrome – variation on a theme? Networks in the brain. While I am waiting to hear back about my ERC starting grant application on genetic imaging, I wanted to use the waiting time to introduce a small pioneer study that we performed on functional imaging in Dravet Syndrome. Dravet Syndrome, one of the most prominent genetic epileptic encephalopathies, is due to mutations in SCN1A. The EEG findings progress from an initially unremarkable EEG to frequent generalized activity. Functional MRI offers a possibility to investigate the network underlying these discharges and to pinpoint brain regions involved in generating the epileptiform activity. Given that patients have a common genetic finding, the assumption that discharges are generated by identical networks is intriguing. However, we found that things might not be as simple as that. EEG-fMRI. I am by no means an expert in functional imaging, but this is my hands-on explanation of what EEG-fMRI is used for. Functional magnetic resonance imaging (fMRI) uses the so-called blood oxygenation level-dependent (BOLD) signal. Basically, if a brain region is particularly active, there is more blood flow and this can be quantified. To me, it’s a miracle that this actually works. This BOLD signal can then be overlaid on a standard MRI, which gives you the colorful pictures that you might remember from publications or presentations. In some cases, a so-called “glass brain” is used to show the entire brain at once. The BOLD response takes a bit of time to build up and is not as fast in detecting fluctuations as the EEG, which works in the range of milliseconds. If both technologies are combined, the BOLD response that correlates with discharges can be extracted and visualized. This gives you an idea which brain regions are activated or turned off during a particular discharge. For example, this method has been used earlier to demonstrate that patients with Idiopathic/Genetic Generalized Epilepsy have unique imaging “fingerprints” on EEG-fMRI. In the study by Moehring et al., we tried to use the same technique to find the networks contributing to epileptic discharges in Dravet Syndrome. The BOLD signal associated with interictal discharges in 10 patients with SCN1A-positive Dravet Syndrome, projected onto a so-called “glass brain”. As you can tell at first glance, there is no common pattern. However, in 7/10 patients, the default mode network was involved, providing an interesting hypothesis for the cognitive impairment seen in patients with Dravet Syndrome. What we found. We saw a large variability and could not find a common activation pattern in 10 patients with SCN1A-positive Dravet Syndrome. To us, this was surprising, given the genetic homogeneity and also the relatively homogenous clinical phenotype. 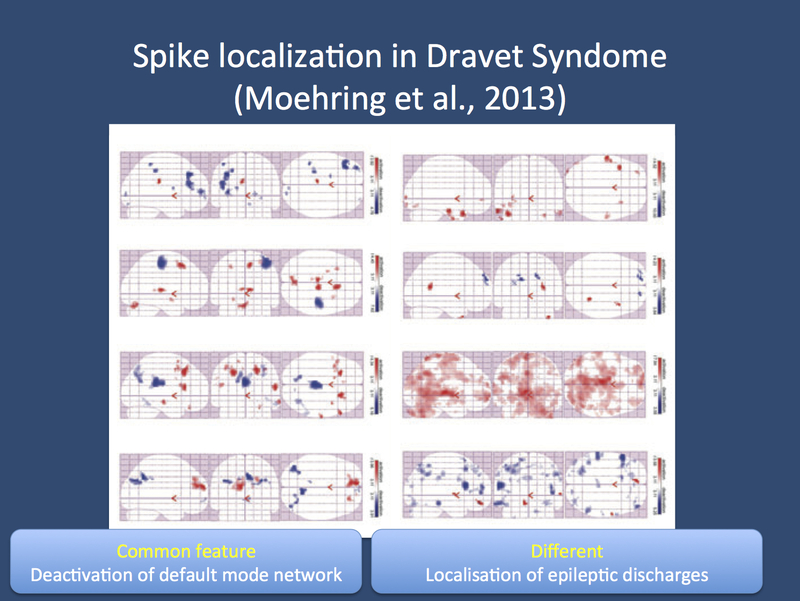 However, it seems that the generalized discharges seen on routine EEG in patients with Dravet Syndrome are in fact generated by different networks. While it might well be that this is due to confounding factors such as the age of the patients or different medications, I would have expected much more homogeneity than this. Endophenotypes should converge, not diverge. However, this finding demonstrates how little we know about everything that is between genotype and phenotype. There was, however, another finding in this study that I found remarkable. The default mode network. I have talked about the default mode network (DMN) extensively in my presentation in Brussels and the study by Moehring et al. was one of my main motivations for this. The DMN is one of the resting state networks of the human brain. If we close our eyes and do nothing, our brain is still active and consumes as much energy as it does during focused attention. Much of this activity happens in so-called resting state networks, synchronous BOLD signals in certain brain regions that suggest that these regions are somehow functionally connected. Connectivity of the DMN is related to cognitive functioning. In our study, we found that 7/10 patients showed activation of the DMN during the interictal discharges. One may hypothesize that this might help explain the epileptic encephalopathy in patients with Dravet Syndrome and might differentiate the discharges seen in Dravet Syndrome from other “non-encephalopathic” discharges seen in other generalized epilepsies. For example, the discharges in Dravet Syndrome and Juvenile Myoclonic Epilepsy may look alike at first glance in routine EEG, but might actually involve different networks of the brain. In Dravet Syndrome, one might see an impairment of networks required for cognitive functioning, while this might be less prominent in other generalized epilepsies. ERC again. My ERC grant revolved around the connectivity of the default mode network. The basic idea of my grant was to use connectivity of the resting state as a quantitative trait in families with epilepsies and genetic epilepsies with known mutations to identify common fMRI endophenotypes. While the term endophenotype is often used in the context of neurogenetic disorders and particularly epilepsies, gene finding based on endophenotypes has always been a rarity. We wanted to change this by doing systematic large-scale functional imaging in genetic epilepsies, and I am waiting to hear back from the ERC any day. This entry was posted in 2013, Epileptic encephalopathy, EuroEPINOMICS, Opinion, Papers and tagged default mode network, Dravet Syndrome, EEG/fMRI, epileptic encephalopathy, ERC Starting Grants, fMRI, genetic imaging, resting state, SCN1A. Bookmark the permalink. Thank you so very much for your research in Dravet. My sweet 4 year old grand daughter suffers from this and we pray for any help that is offered.